The Ohio State Fair is one of those events you really have to see to believe. To experience the fair is to experience fun, entertainment, food, learning, rides, music, art, and more. Every year, tens of thousands of people from around the world stream into Columbus for several days of fair greatness and you can join in on the fun. The Ohio State Fair is 12 days of excitement during the last week of July through the first week of August. It is a fun-filled event that has something for young and old alike. Time: 9 a.m. – 10 p.m. daily, except August 6 until 7 p.m.
You won't want to miss each year's line-up of concerts. Every night has a new headliner and many great musical acts fill the WCOL Celeste Center on the fairgrounds. Be sure to keep an eye out for this year's list of acts. They are typically announced in late February or early March and if you want the best seats for the biggest acts, you'll need to get your tickets fast. Concert tickets are sold through Ticketmaster, both online at retail locations. Don't miss some of the fair's free entertainment before the big show, there are many great bands playing the outdoor stages throughout the fair. There is always something going on at the Ohio State Fair and it can be a lot to take in. From kid-friendly fun at Kiddieland to the livestock barns and activities at the Youth Center and Natural Resources Park, there's a lot to see, do, and enjoy. Free musical entertainment changes regularly at each of the outdoor stages, shopping can be found at the MarketPlace, and new daily attractions are added every year. We can't forget the food, either! With almost 200 vendors and over 30 items on a stick, you will not go hungry. Possibly the most troubling part of attending the Ohio State Fair is deciding what to do and where to go. Look at the schedule for the day you're attending and see what peaks your interest and have a list of your family's 'must see' attractions. But don't plan too much, half the fun of the fair is finding something you didn't know about. The organizers of the Ohio State Fair try to make it easy for everyone to get around the fairgrounds. The free State Fair Shuttle Express makes frequent stops around the perimeter of the grounds. AAA has complimentary courtesy shuttle service that will get you to your car as well. Stroller, wagon, wheelchair, and electric cart rentals are available on a first-come, first-serve basis. Purses, backpacks, book bags, coolers, strollers, etc. are permitted and subject to search. No alcohol or illegal substances or weapons are permitted. You will pass through a magnetometer. You may bring your own food and non-alcoholic drinks but glass containers are prohibited. Tip: Keep an eye out for specially marked recycling containers around the fairgrounds for cans, plastic bottles, etc. Your fair experience will be 10 times better if you download the free Ohio State Fair app on your phone. 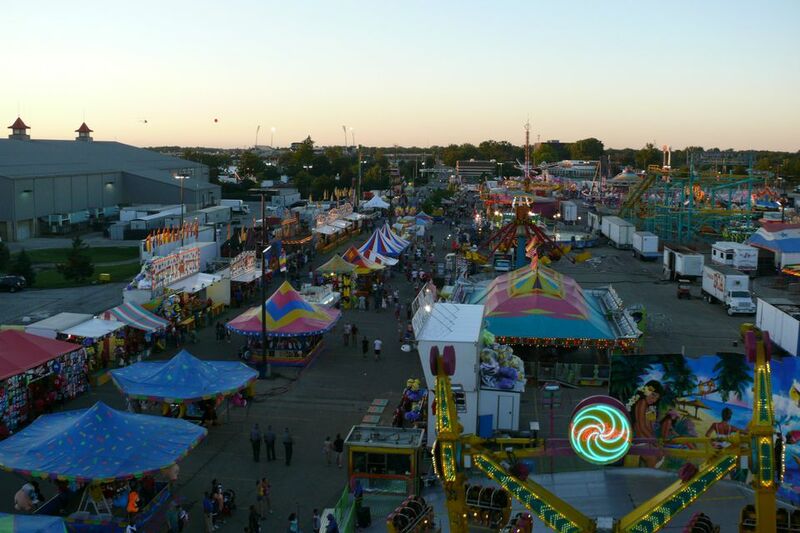 Available for iOS and Android devices, this is the fair-goer's ultimate guide to the fair. The app includes many more features; these are just a few of our favorites. Pin your parking spot. No more losing your car and walking aimlessly around the lot, just remember to pin your location when you get out of the car. Food finder. In the mood for a particular type of food on a stick or wondering where your favorite vendor is this year? Build a custom schedule of events. Add only those events you're interested in so you don't miss a thing. Fair FAQs and maps. If you have a question or want to know where a venue is, just turn to the map and the FAQs for your answer.